This is not intended to be a complete and exhaustive list of all the resources, projects and publications dealing with the various aspects of Wood Bison management in Northwestern Canada, but it should provide a good beginning. If you are aware of other information and resources that should be included, please contact the Bison and Roads Steering Committee. Gates, C.C., R.O. Stephenson, H.W. Reynolds, C.G. van Zyll de Jong, H. Schwantje, M. Hoefs, J. Nishi, N. Cool, J. Chisholm, A. James and B. Koonz. 2001. National Recovery Plan for the Wood Bison (Bison bison athabascae). National Recovery Plan No. 21. Recovery of Nationally Endangered Wildlife (RENEW). Ottawa. Ontario. 50 pp. The National Wood Bison Recovery Team is currently preparing an updated Recovery Strategy for Wood Bison. The Recovery Strategy will undergo extensive review and consultation prior to formal approval. Government of the Northwest Territories, Department of Environment and Natural Resources. 2010. Wood Bison Management Strategy for the Northwest Territories 2010 – 2020. Environment and Natural Resources, Northwest Territories maintains an information page about Wood Bison, and a Species at Risk page. Government of Yukon. 2012. Management Plan for the Aishihik Wood Bison (Bison bison athabascae) Herd in southwestern Yukon. 28 pp. Jung, T. S., and S. M. Czetwertynski. 2013. Niche overlap and the potential for competition between reintroduced bison and other ungulates in southwestern Yukon. 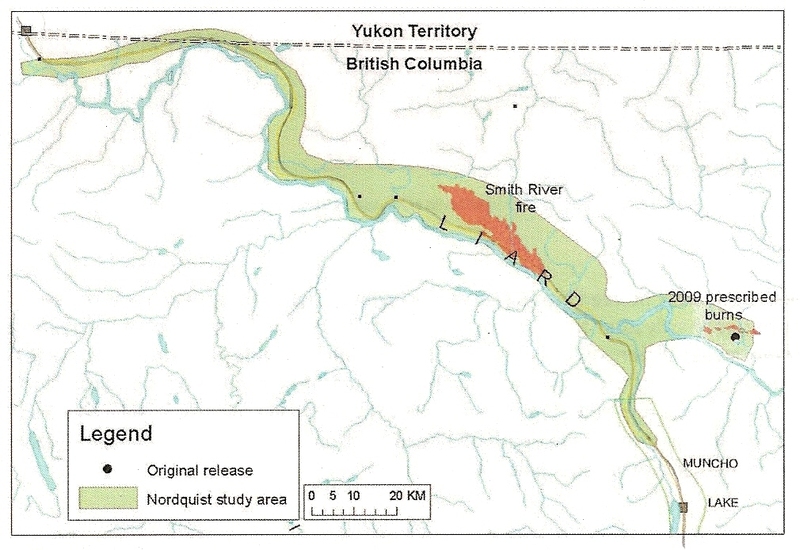 Yukon Fish and Wildlife Branch report TR-13-15. Whitehorse, Yukon, Canada. Jung, T. S., and K. Egli. 2012. Population inventory of the Aishihik Wood Bison (Bison bison athabascae) population in southwestern Yukon, 2011 Yukon Fish and Wildlife Branch Report TR-12-19. Whitehorse, Yukon, Canada. 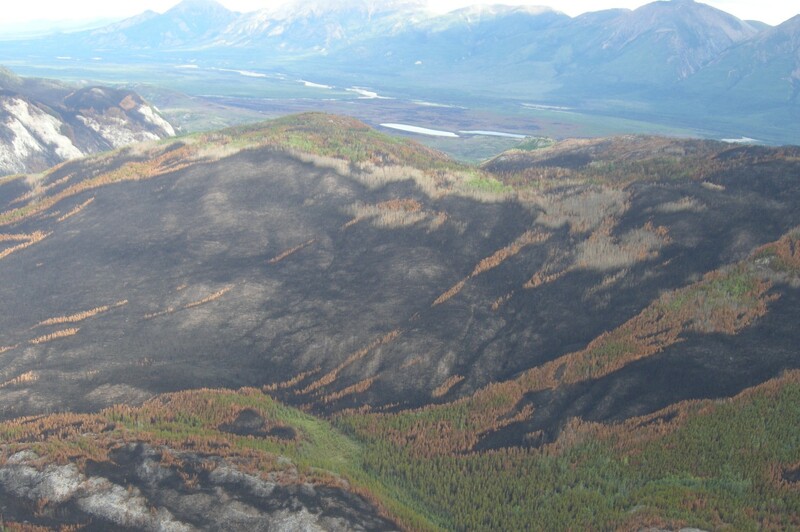 Wood Bison Banter is published once a year by Environment Yukon on behalf of the Yukon Wood Bison Technical Team to highlight current news and rules. Environment Yukon has provided additional information about Wood Bison on their Species at Risk page. Mitchell, J.A. and Gates, C.C. 2002. Status of the Wood Bison (Bison bison athabascae) in Alberta. Alberta Sustainable Resource Development, Fish and Wildlife Division, and Alberta Conservation Association, Wildlife Status Report No. 39, Edmonton, AB. 32 pp. BC Species and Ecosystems Explorer. This a source for authoritative conservation information on approximately 6000 plants and animals, and almost 600 ecological communities (ecosystems) in British Columbia. Harper, W.L., J.P. Elliott, I. Hatter, and H. Schwantje. 2000. Management Plan for Wood Bison in British Columbia. B.C. Ministry of Environment, Lands and Parks, Victoria, B.C. 43 pp. Thiessen, C. 2010. Peace Wood Bison Project: Annual Report 2009/10. Ministry of Environment. 22 pp. Selected publications on Wood Bison in Northwestern Canada. Boyd, D.P. 2003. Conservation of North American Bison: Status and Recommendations. Thesis. University of Calgary. Calgary, Alberta, Canada. Government of Alberta, Ministry of Sustainable Resource Development. 2011. Managing Disease Risk in Alberta’s Wood Bison. Pub. No. 1/488. Government of Alberta, Ministry of Sustainable Resource Development. 2011. Managing Disease Risk in Alberta’s Wood Bison with Special Focus on Bison to the West of Wood Buffalo National Park. Pub. No. 1/488. Feb 2011. Government of Alberta, Ministry of Sustainable Resource Development. 2011. Managing Disease Risk in Alberta’s Wood Bison with Special Focus on Bison to the West of Wood Buffalo National Park: 2010 and Winter 2010-2011 Progress Report. Pub No. 1/548 June 2011. Harper, W. L., and C.C. Gates. 2000. Recovery of Wood Bison in British Columbia. In: Darling, L.M. (ed). Proceedings of a Conference on the Biology and Management of Habitat and Species at Risk, Kamloops, B.C., 15-19 Feb. 1999, Vol. 2, B.C. Ministry of Environment. p. 915-924. Hartop, Barton V., William Mandeville, Nahum Lee, Deborah Johnson. 2009. Bison Control Area Program: Annual Report of Survey Activities November 2007 – April 2008. Government of the Northwest Territories, Department of Environment and Natural Resources, Fort Smith, NT. Manuscript Report No. 192. Jensen, O. C., Nishi, J., Cool, N.L., Poll, D. and H. W. Reynolds. 2004. Assessing Suitable and Critical Habitat for Wood Bison (Bison bison athabascae) Using Geographic Information Systems (GIS) and Remote Sensing: Preliminary Results. In: Hooper, T.D. (ed). Proceedings of the Species at Risk 2004 Pathways to Recovery Conference. 2-6 Mar. 2004, Victoria, B.C. Species at Risk 2004 Pathways to Recovery Conference Organizing Committee, Victoria, B.C. 18 pp. Larter, N.C., A.R.E. Sinclair, T. Ellsworth, J. Nishi and C.C. Gates. 2000. Dynamics of reintroduction in an indigenous large ungulate: the wood bison of northern Canada. Anim. Conserv. 4: 299-309. Larter, N.C., Nishi, J.S., Ellsworth, T., Johnson, D., More, G., and D.G. Allaire. 2003. Observations of Wood Bison Swimming Across the Liard River, Northwest Territories, Canada. Arctic Vol. 56. No. 4: 408-412. Larter, N.C., Allaire, D.G., and T.S. Jung. 2007. Population Survey of the Nahanni Wood Bison Population. March 2004. Manuscript Report No. 176. Leverkus, S. 2011. Wood Bison in North East British Columbia. Prepared for the Government of BC, Ministry of Natural Resource Operations, Fort St. John, BC. 56 pp. Leverkus, S., and Charles Dickie. 2010. Wood Bison Monitoring and Recovery in North East British Columbia. Prepared for Fort Nelson First Nation, Fort Nelson, BC. 7pp. Mitchell, J.A., Gates, C.C., Rowell, R., and K. Lloyd. 2000. A Decision Support Tool for Managing the Risk of Tuberculosis and Brucellosis in Northern Canada. In: Darling L.M. (ed). Proceedings of a Conference on the Biology and Management of Habitat and Species at Risk, Kamloops, B.C., 15-19 Feb. 1999, Vol. 2, B.C. Ministry of Environment. pp. 173-178. Redburn, M.J., Strong, W.L., and C.C.Gates. 2008. Suitability of boreal mixedwood clearcuts as wood bison (Bison bison athabascae) foraging habitat in north-central Alberta, Canada. Forest Ecology and Management 255: Issue 7, p. 2225-2235. Reynolds, H.W., C.C. Gates, and R.D. Glaholt. 2003. Bison (Bison bison). Pages 1009-1060, in Feldhammer, G.A., B.C. Thompson, and J.A. Chapman. eds. Wild Mammals of North America. Biology, Management, and Conservation. second Edition. The Johns Hopkins University Press. Baltimore and London. 1216 pp. Wildlife Branch, Ministry of Environment, Lands and Parks. 2000. Bison in British Columbia: Ecology, Conservation and Management. B.C. Ministry of Environment, Lands and Parks. Victoria. B.C. Canada. 5 pp. Wildlife Branch, Ministry of Water, Land and Air Protection. 2002. Wildlife in British Columbia At Risk: Wood Bison. B.C. Ministry of Water, Land and Air Protection. Victoria, B.C. Canada. 5 pp. The Department of the Environment and Natural Resources in the Northwest Territories has developed a Bison Collision Report, and developed policies and protocol on reporting, dispatching and disposing of bison involved in vehicle collisions where natural recovery is not possible. The report also contains instructions on collecting biological samples, where required. Public Works and Government Services Canada (PWGSC) staff are using the Otto Wildlife device to record Wood Bison carcasses and live sightings along the road. The Otto Wildlife is a portable GPS-based device that can record Points of Interest (POI). Data collected are date, time, latitude, longitude, species (choice of 20), and dead or alive. The data can be exported in a CSV format (comma separated value) to the user's PC for processing in Excel, Access or GIS programs. Use of Otto Wildlife data should help enable PWGSC and ICBC to map locations delineating collision hot spots and to map herd locations in order to assist in providing timely warnings to motorists. Wildlife warning signs come in a variety of shapes and sizes. An effective wildlife warning sign is one that conveys the danger that the animal poses to the motorist, not merely the presence of the animal on the road. Static wildlife warning signs - ones that are in the same place day in and day out, year in and year out - are not effective. Some studies show that high percentages of motorists do not even notice those types of signs. They fade into the landscape. To be effective, wildlife warning signs need to be in place when the hazard is high, and removed when the hazard is lower. Seasonal signage, non-traditional messages, moveable signage, variable message boards, and hinged signs that can be covered up and uncovered as required, are all ways to make signage more noticeable. This is not intended to be a complete inventory of all bison warning signs. 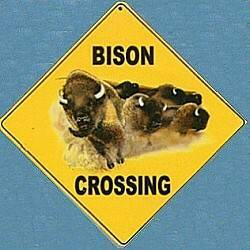 If you know of a sign that is not represented here, please contact the Bison and Roads Steering Committee. not in use as yet. This series of three 11 x 17 inch posters was developed by the Wildlife Collision Prevention Program and Public Works and Government Services Canada. Distribution at lodges, gas stations, and restaurants along the BC portion of the Alaska Highway began in 2007. This poster was distributed through Post Office Boxes to residents in the Hay-Zama area, in Alberta. This newspaper ad ran in the local paper in the Hay-Zama area, in Alberta. Kiosks with bison collision awareness signs are located at 4 rest area locations along the Alaska Highway, between Fort Nelson and the BC/Yukon border. An additional sign and kiosk is located at Liard Hot Springs Provincial Park. The Liard Hot Springs Provincial Park is a popular overnight destination for Alaska Highway travelers. An estimated 27,000 visitors go through the park gate in the summer season. The Wildlife Collision Prevention Program, in partnership with BC Parks and the TransWild Alliance, developed a simple black and white (4.25” x 5.5”) handout which was passed out at the Liard Hot Springs Provincial Park gate when Park entrance tickets were purchased. The Wildlife Collision Prevention Program, in partnership with BC Parks and the Yellowstone to Yukon Conservation Initiative, designed a full colour bookmark which was passed out at the Liard Hot Springs Provincial Park gate when Park entrance tickets were purchased.